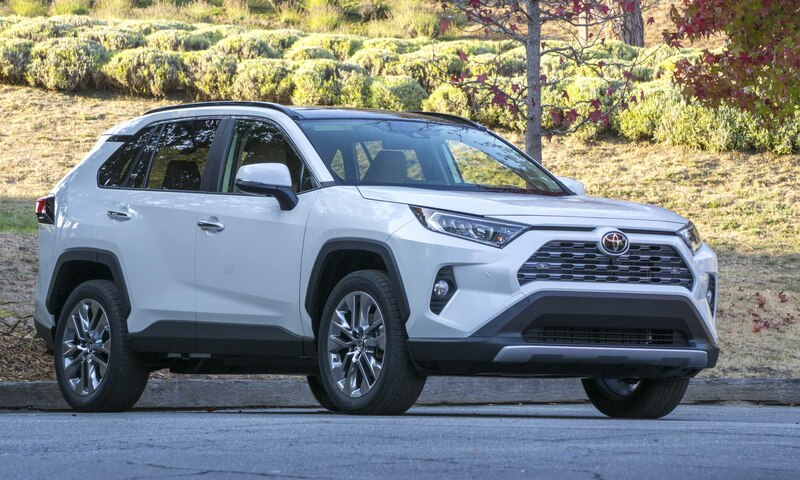 The popularity of small crossovers in America is stronger than ever, and leading the pack as it has for several years is the Toyota RAV4. 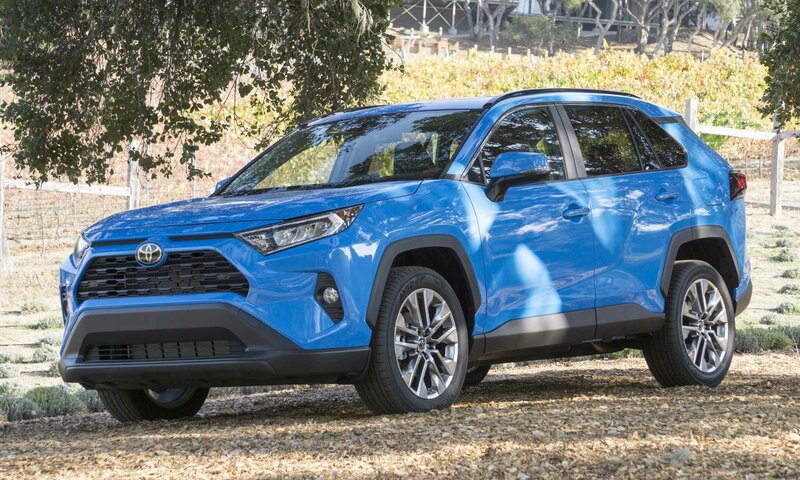 Toyota has every intention of holding onto its privileged spot — a task likely to succeed thanks to an all-new 2019 RAV4. 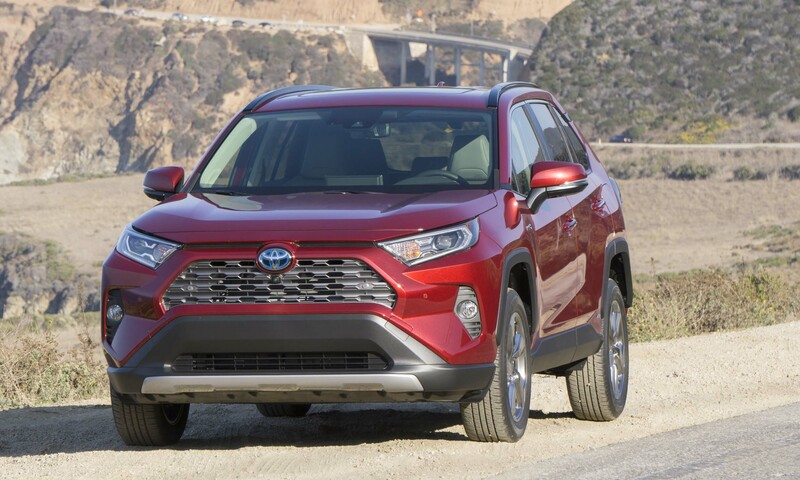 With bold new styling, improved capability, better performance and an array of new safety and convenience features, this fifth-generation RAV4 should be very popular with American car shoppers. Toyota first came to market with the Recreational Active Vehicle 4-Wheel Drive — or RAV4 — in the mid-1990s. 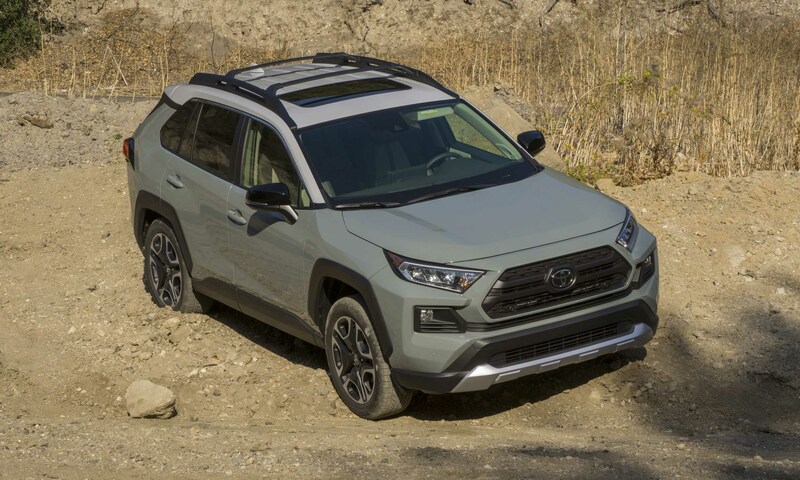 Well before the term “crossover” had been coined, the small 2-door SUV offered the capability and utility of a sport-utility vehicle but in a smaller, more manageable package. 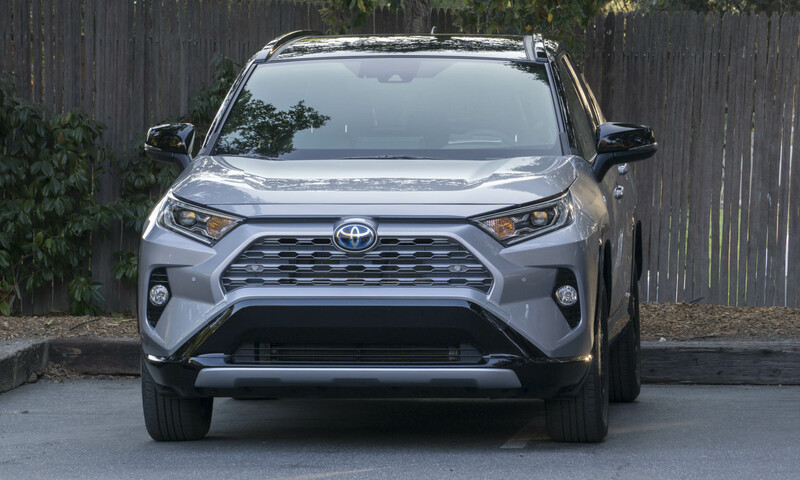 Although the RAV4 has undergone many iterations over the last 20-plus years, the idea behind the RAV4 hasn’t really changed. 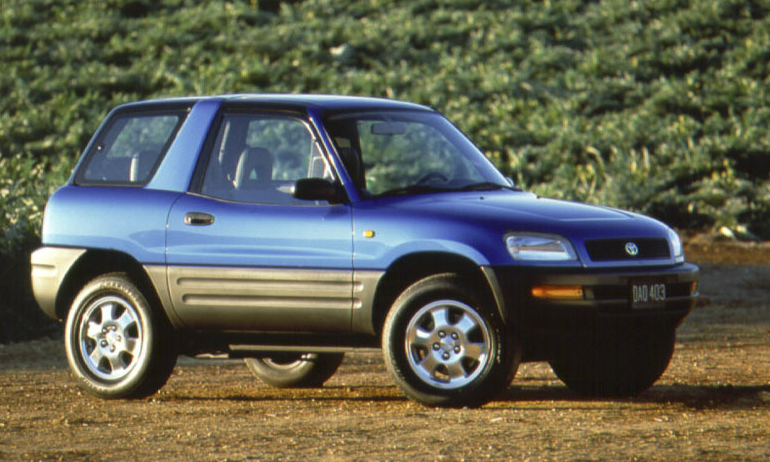 That said, the RAV4 itself has changed quite a bit. 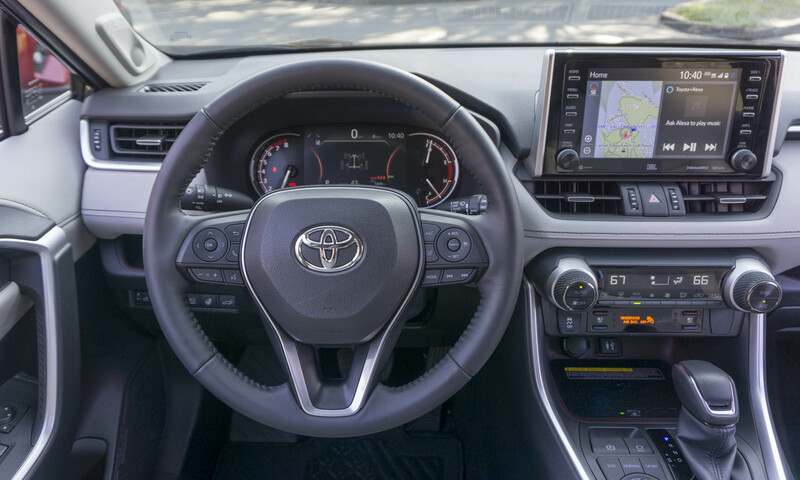 In addition to the updated styling and range of new features, the 2019 RAV4 is built on the Toyota New Global Architecture platform which is designed to increase capability, comfort and safety. 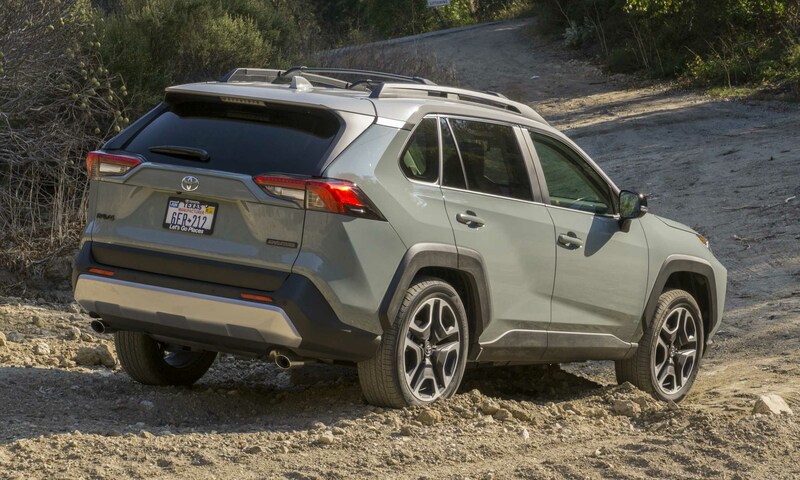 With this new platform, the RAV4 is 57 percent more rigid than its predecessor, which enables a smoother, quieter ride. While ground clearance has been increased, the overall center of gravity has been lowered for improved handling. 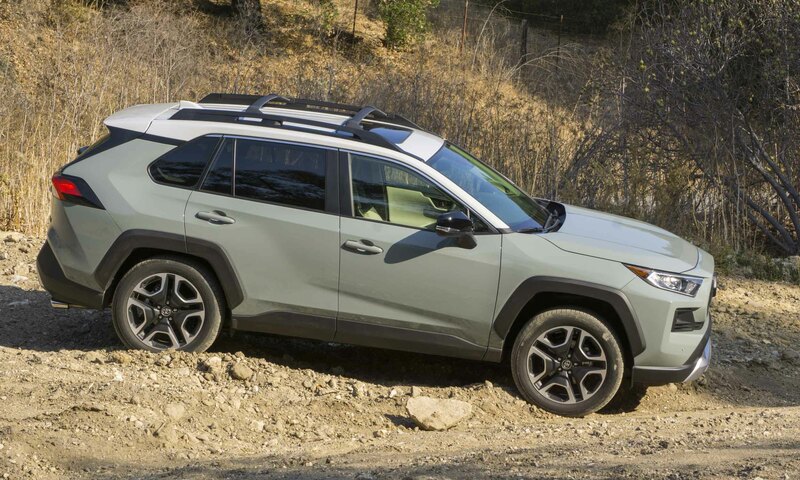 Overall the RAV4 is built on a longer wheelbase that increases rear-seat room; at the same time, the overhangs (the amount of vehicle that extends past the front and rear wheels) are shorter for better off-road capability. With a renewed commitment to safety across its entire model line, Toyota offers the RAV4 with Toyota Safety Sense 2.0 as standard equipment. This suite of safety features includes a pre-collision system with pedestrian detection, lane departure alert with steering assist, automatic high beams, full-speed range dynamic cruise control and lane tracing assist. Also standard is a complimentary three-year subscription to Safety Connect, which includes emergency assistance, stolen vehicle locator, automatic collision notification and roadside assistance. 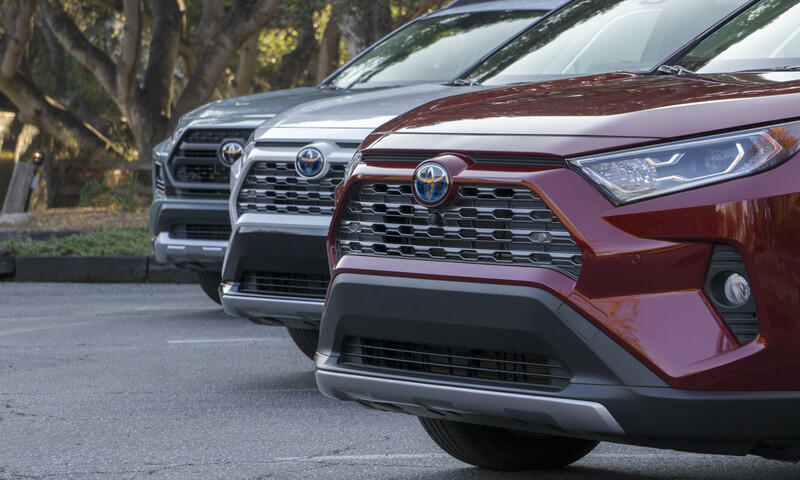 The all-new 2019 Toyota RAV4 is available in a wide variety of trim levels ranging from basic to premium to sporty. Gas-powered models have standard front-wheel drive (except Adventure) — all-wheel drive is available for an additional $1,400. All Hybrids have standard all-wheel drive — the hybrid powertrain is an $800 step up from the corresponding gas-powered all-wheel-drive trim. The most elementary trim in the RAV4 lineup, the LE has a base price of $25,500. 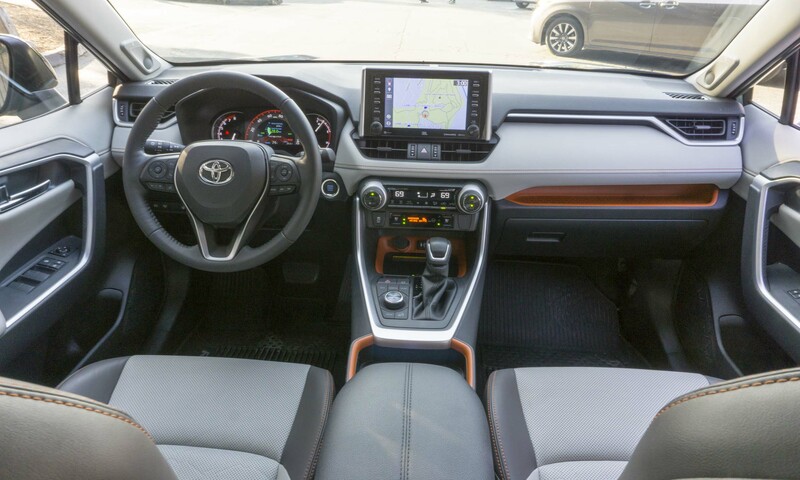 Standard features include climate control with dust and pollen filter, a rearview camera, one USB port, Bluetooth connectivity, privacy glass and Toyota’s Entune 3.0 audio system with a 7-inch touchscreen and Apple CarPlay. Integrated roof rails, LED headlights, an integrated rear spoiler and 17-inch steel wheels are also standard. With a starting price of $27,300, the XLE upgrades the LE with dual-zone climate control, heated power mirrors, a power moonroof, five USB ports, a smart key with pushbutton start, a cargo-area cover, integrated fog lights and 17-inch alloy wheels. Priced at $29,500, the XLE Premium adds Softex-trimmed seats (Softex is Toyota’s synthetic leather), a power driver’s seat, a leather-trimmed steering wheel, anti-slip in-dash storage trays, a power liftgate and 19-inch chrome-finished alloy wheels. XLE Premium is not available as a hybrid — the equivalent hybrid trim is the sportier XSE. 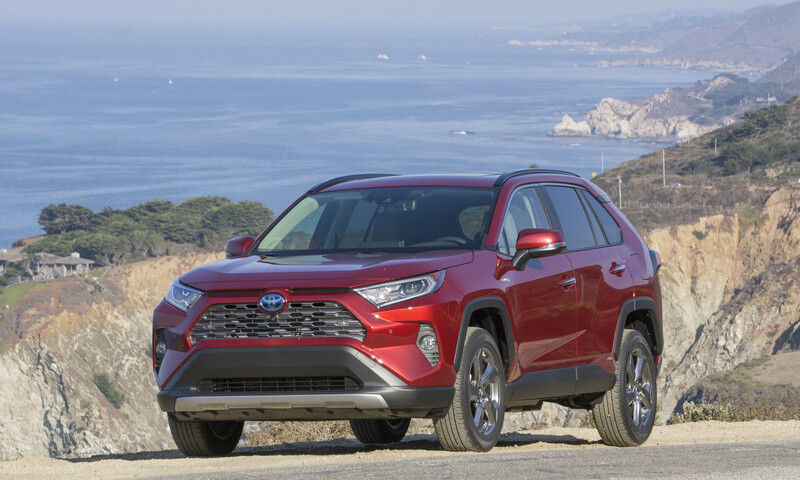 The Limited is the top-level trim of the RAV4, be it with a gas or hybrid powertrain. With a base price of $33,500, the Limited features an 8-inch touchscreen display, an AM/FM/HD audio system, GPS navigation, heated front seats, a digital instrument cluster, a digital rearview mirror, dark brown interior accents and blue ambient lighting. The Limited also stands out with a dark gray front grille and puddle lights. 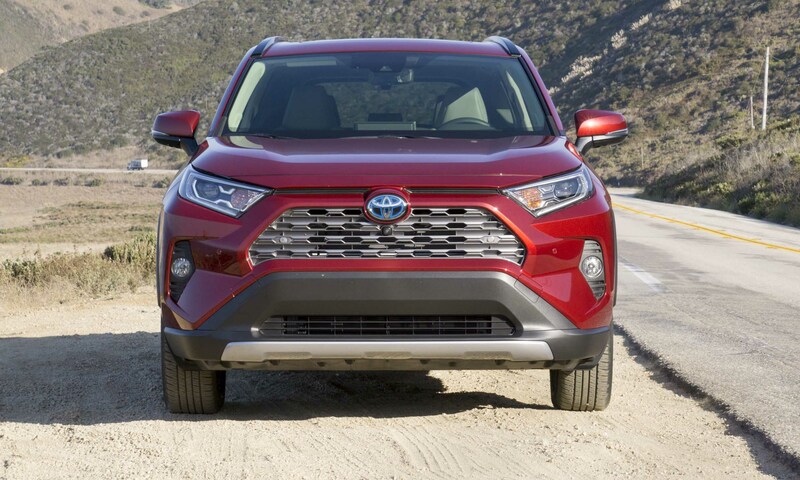 The Adventure is a standout in the RAV4 lineup. 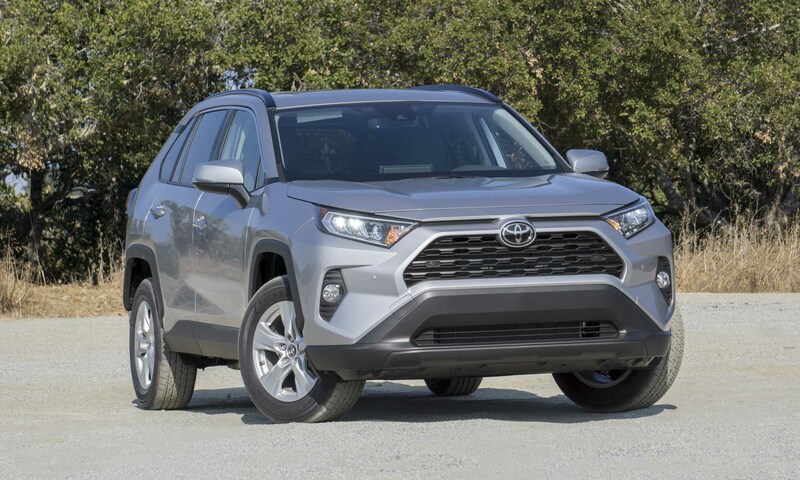 Available only as a non-hybrid with standard 4WD, the Adventure gets a specific grille and additional ground clearance that make this RAV4 look a bit like a mini 4Runner (Toyota’s iconic midsize SUV). Priced at $32,900, the Adventure is equipped with the digital speedometer and gauges, Softex-trimmed seats with orange accents and stitching, anti-slip door grips, orange interior accents and matte black 19-inch alloy wheels. The XSE is another distinctive player in the RAV4 Hybrid lineup, offering a sportier option. With a starting price of $33,700, the XSE gets a sport-tuned suspension, 18-inch black sport alloy wheels, integrated fog lights, a dark gray front grille, two-tone exterior color, black side mirrors, a digital rearview mirror, Softex-trimmed heated front seats with fabric inserts and blue stitching and blue ambient lighting. 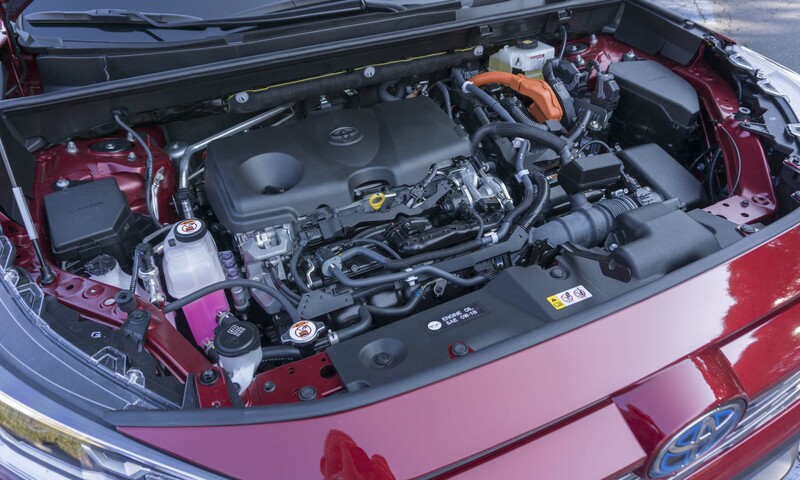 The 2019 Toyota RAV4 has two engine options — a purely gas-powered engine and a hybrid powertrain. The gas-powered RAV4s get a new 2.5-liter Dynamic Force 4-cylinder engine producing 203 horsepower and 184 lb-ft of torque. A direct-shift 8-speed automatic transmission sends power to either the front wheels or all four wheels. All gas-powered RAV4 models equipped with all-wheel drive employ Toyota’s Multi-Terrain system that lets the driver choose the mode that best fits the current terrain. Options of Mud & Sand, Rock & Dirt or Snow change how torque gets delivered, as well as how much wheelslip is allowed. Limited and Adventure trims get a more advanced all-wheel-drive system that features dynamic torque vectoring. Additional traction is provided as the system delivers up to 50 percent of the available torque to the rear wheels and then distributes it right to left as needed. Also included is a rear-driveline disconnect — when all-wheel drive isn’t needed, the rear axle can be disconnected, thus reducing drag and improving fuel economy. 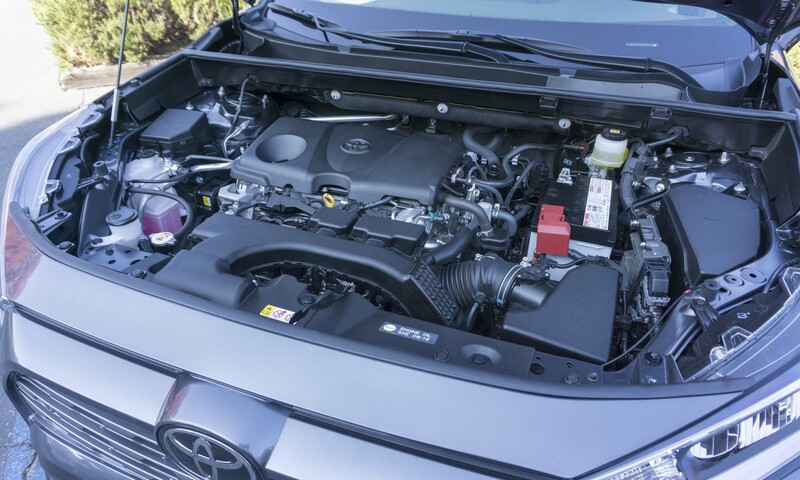 The RAV4 Hybrid uses the same 2.5-liter Dynamic-Force 4-cylinder engine as the non-hybrid; however, in this case the engine is producing 176 horsepower. The engine is teamed with two electric motors — one to power the front wheels, and a second to power the rear wheels. 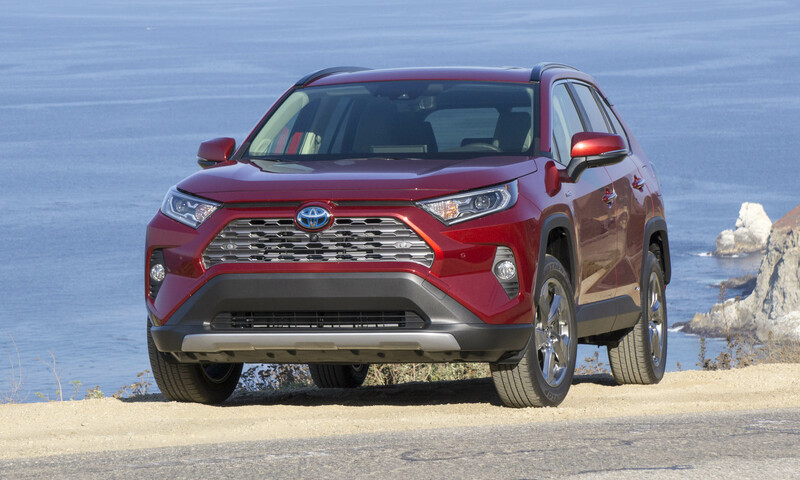 Total output is 219 horsepower; yes, the hybrid also is the most powerful version of the RAV4. Power gets transmitted via an electronically-controlled continuously-variable transmission. 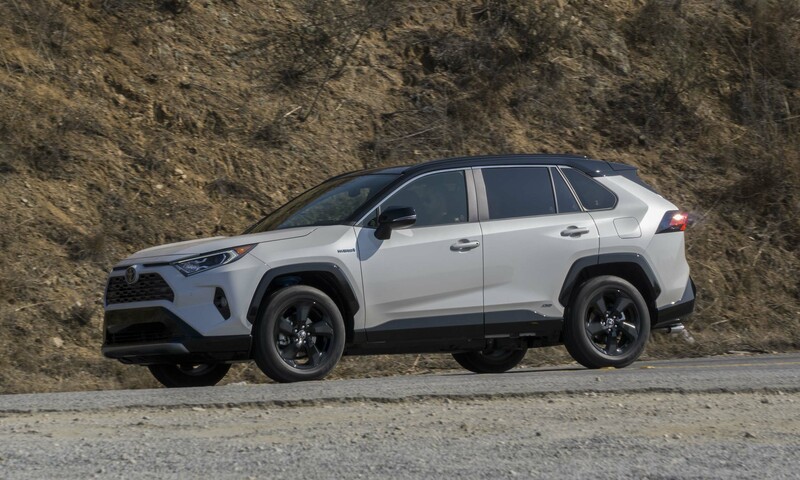 For 2019 the RAV4 Hybrid’s rear motor provides 30 percent more torque than in the previous generation. This helps eliminate front wheelslip when accelerating in slick conditions, as well as reducing understeer during spirited driving. The increased power to the rear wheels also aids off-road capability. 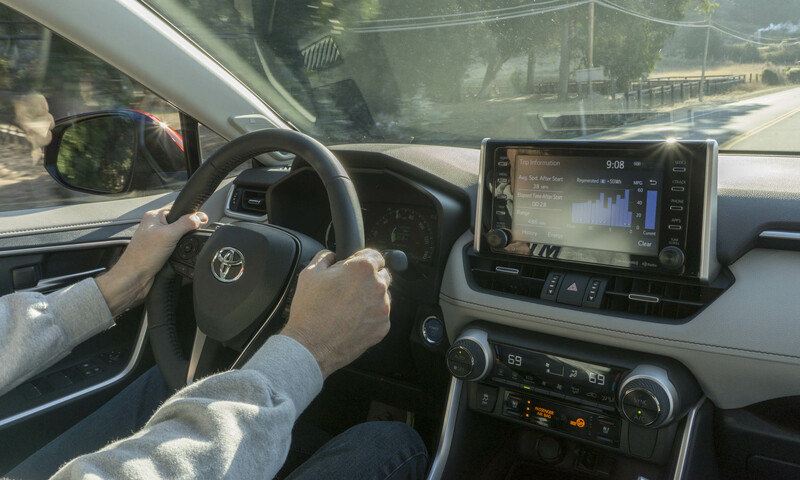 The RAV4 achieves impressive fuel economy in both gas and hybrid guise. EPA ratings are listed at 26 city / 34 hwy / 29 combined for LE and Limited FWD trims, with XLE and XLE Premium achieving a slightly better 27 mpg in the city. (AWD only drops fuel economy by 1 mpg for these trims.) The Adventure and Limited AWD get 24 city / 32 hwy / 27 combined. All Hybrids are rated at the same 41 city / 37 hwy / 39 combined. 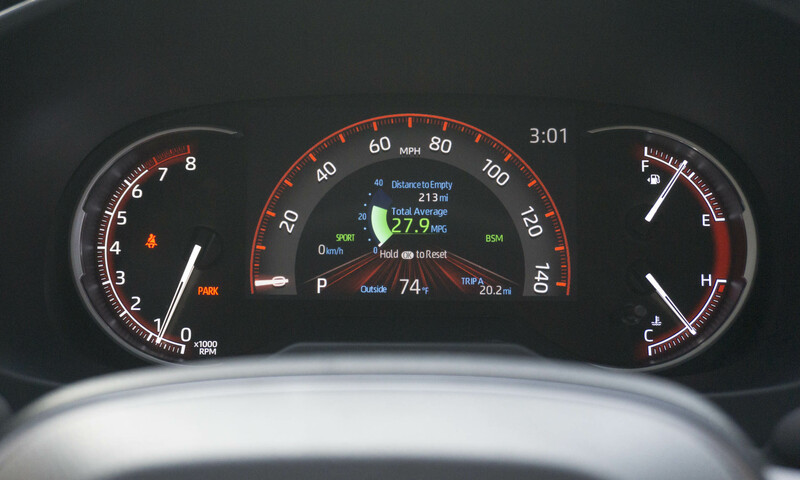 Remember that the hybrid also produces more power — an impressive feat with the jump in fuel economy. For those seeking to tow small trailers with their RAV4s, the Adventure is the trim of choice with its 3,500-pound towing capacity. The rest of the gasoline lineup offers 1,500 pounds of towing capability, while the hybrids improve that slightly to 1,750 pounds. 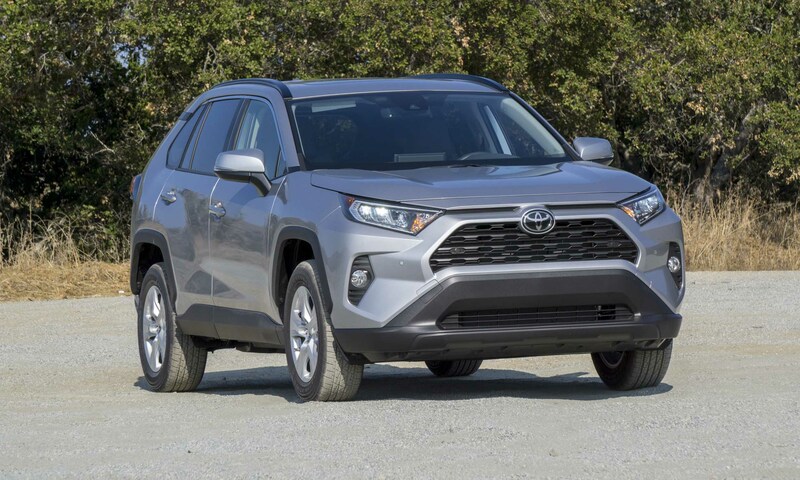 The 2019 RAV4 has a wide variety of comfort and convenience features that depend on the trim level, but overall the new RAV4 feels much more upscale inside. Folks will appreciate the hard buttons alongside the display screen that make for easy access to audio, navigation and communication. Volume and tuning knobs have rubber grips, making them easy to use even with gloves on. The rubberized knobs are also present for the temperature controls. 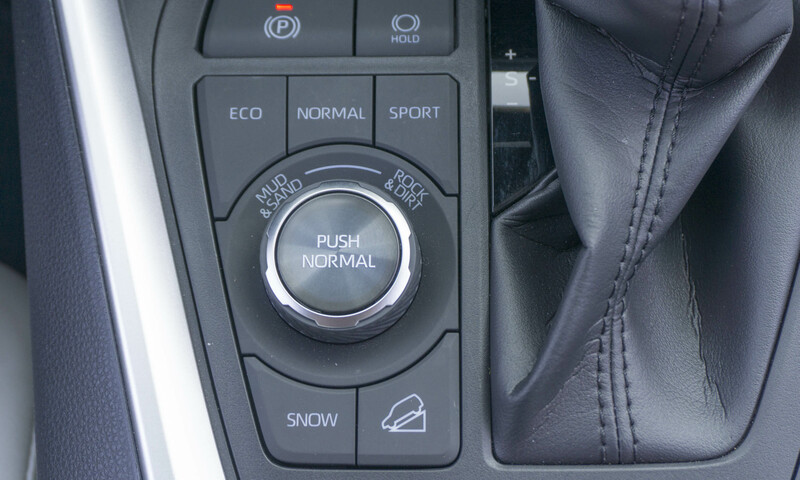 Climate control is a separate unit smartly integrated into the center console. There’s plenty of storage in the new RAV4 provided by a standard glove box as well as center storage under the armrest. In addition, there’s a small shelf accessed from the front passenger seat that is a perfect size for placing a phone or another small item. The higher trims feature a rubberized surface, so items stay secure — on the lower-level trims with a hard plastic surface, items could go flying in the first corner. These storage locations are all outlined in orange on the Adventure — a nice touch. 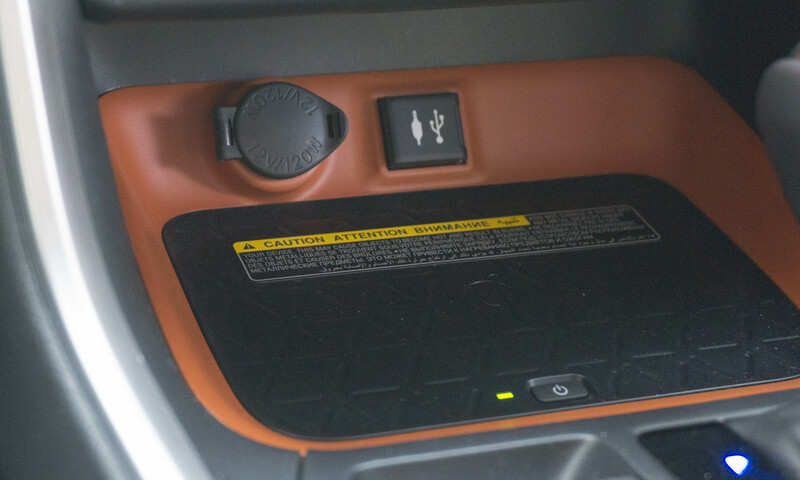 Behind the gearshift is an additional storage area that can be equipped with a wireless charging pad. There are also a USB and a 12-volt charge port in this location — two more USB ports can be found in the center storage. 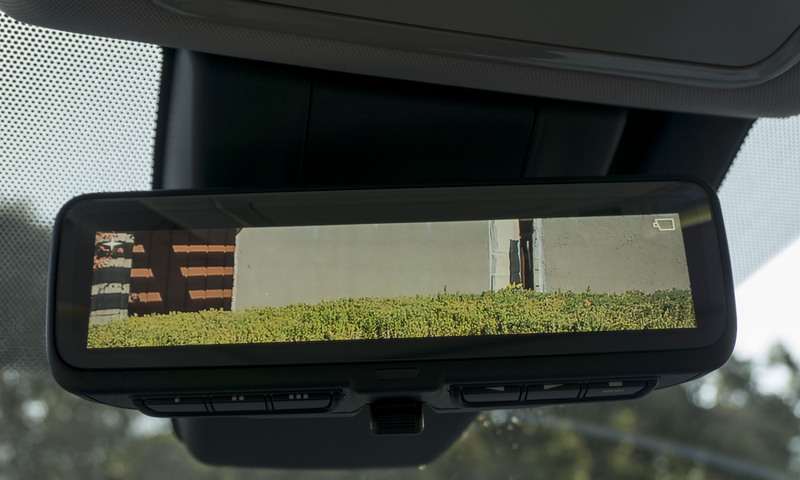 A feature becoming more common in vehicles — and in the top-level trims of the RAV4 — is the digital rearview mirror. The mirror acts like a typical reflective device when off; however, flipping a switch causes the mirror to convert to a display for a rear-mounted camera. There are certainly advantages — the camera display is brighter and can be adjusted — but we aren’t big fans of this new technology. With the camera view it can be difficult to determine how far behind a following vehicle may be — there isn’t any depth of field. And since the driver’s eyes focus on the mirror rather then the view behind, those who use corrective lenses to see items up close will find the mirror a bit out of focus. During our test drive we didn’t have the opportunity to try any fabric seats, although the Softex-trimmed seats are both stylish and comfortable. 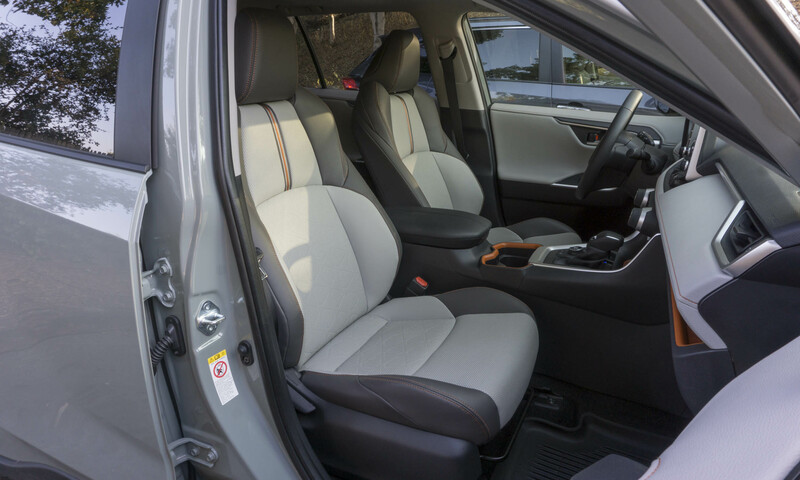 Toyota helps differentiate trims according to different seat designs, and all feature side bolsters on the seat and back for a comfortable ride. A surprising shortcoming: a power passenger seat is not an option, even on top-level trims. Toyota didn’t skimp on the rear seats for the RAV4 — the space has a decent amount of legroom and headroom for passengers at the rear. Available dual USB outlets as well as rear-seat air vents improve the quality of life for those relegated to the back seat. As is typical of a vehicle this size, the middle seat is a bit tight and not as cushioned; however, it will do in a pinch (no pun intended). The RAV4 offers plenty of utility regarding cargo capacity. 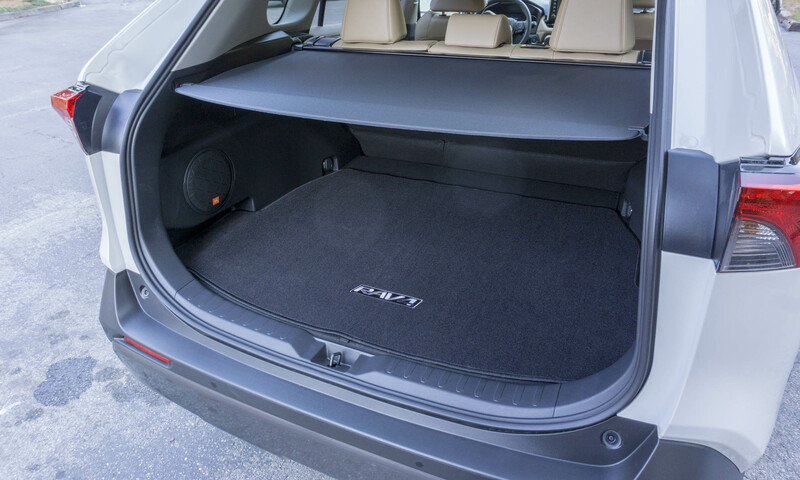 The rear hatch can be power operated and opens wide for easy loading. The available retractable cover keeps cargo hidden from prying eyes. 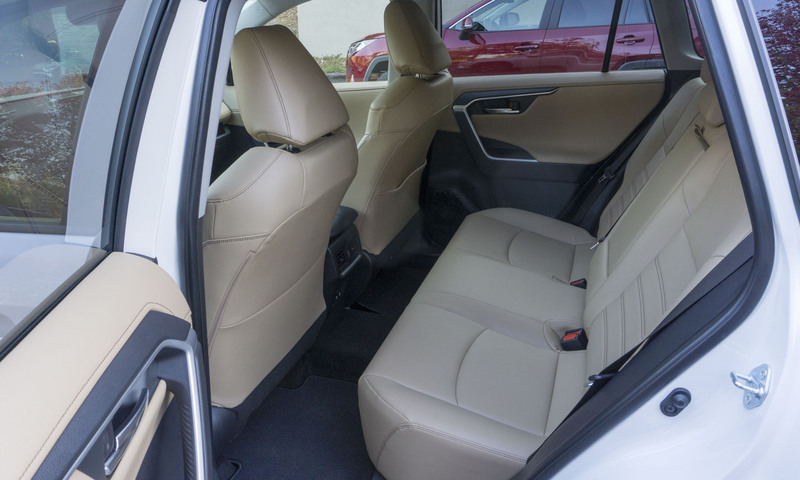 The rear seats can be folded flat, providing an impressively large space for a small crossover. Attending journalists at Toyota’s press event had the opportunity to test both gas-only and hybrid versions of the RAV4 on the roads around Carmel, California. The new platform is definitely noticeable — the small crossover has a smooth and solid ride, which is not always the case in a vehicle of its size. Both models offer strong acceleration, although the 8-speed automatic feels more engaging than the CVT of the hybrid. The regenerative brakes of the hybrid work well to keep the battery charged while providing positive braking feel. The binders are easy to modulate for smooth slowing and stopping — not always the case with regenerative brakes. In our drive we saw 37 mpg on the trip computer; an impressive number for an all-wheel-drive crossover with 200-plus horsepower. 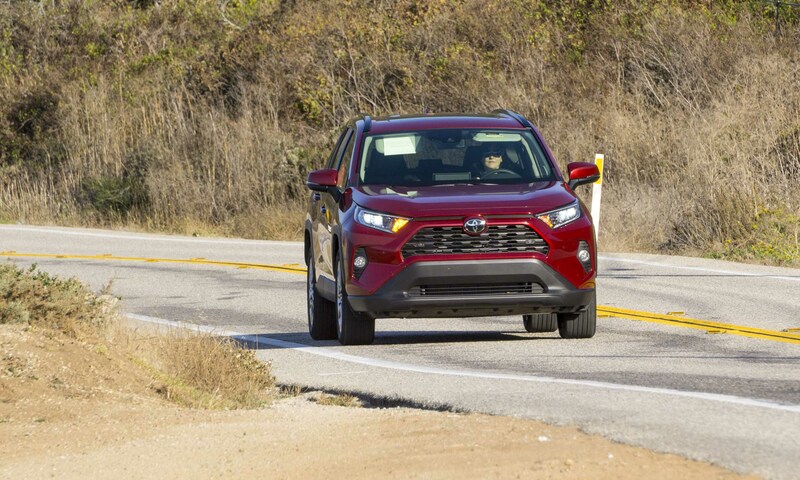 The 2019 RAV4 admits a lot of road noise, especially when the surface gets a bit rough. Even on smooth roads, a considerable amount of exterior noise penetrates the cabin. 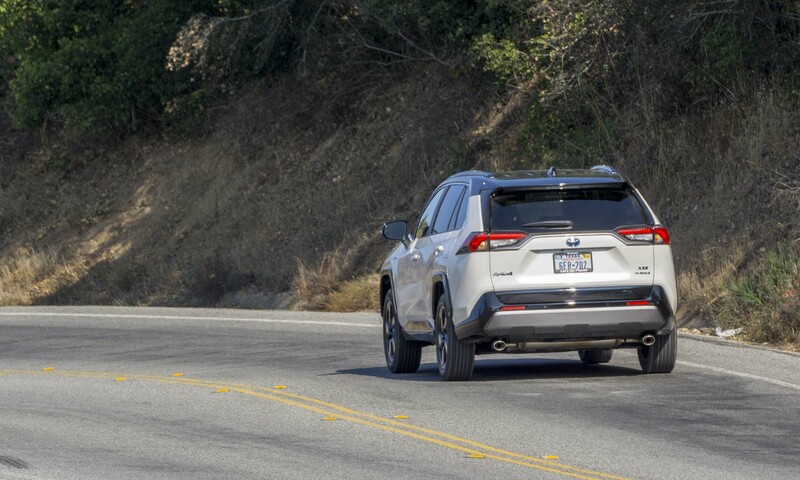 While driving some winding roads around Carmel, the RAV4 performed comfortably with precise steering and reasonable handling. This small crossover is by no means a sporty or high-performance ride, but it isn’t built to be that. Most consumers will find handling to be more than adequate for daily drives. The RAV4 is surprisingly capable when venturing off pavement. There’s plenty of ground clearance on all the trims, ranging from 8.1 inches for the hybrids to 8.6 inches in the Adventure, XLE Premium and Limited. In the Adventure with the torque-vectoring all-wheel-drive system, adventurous journos were able to easily navigate a steep incline of loose sand and dirt. 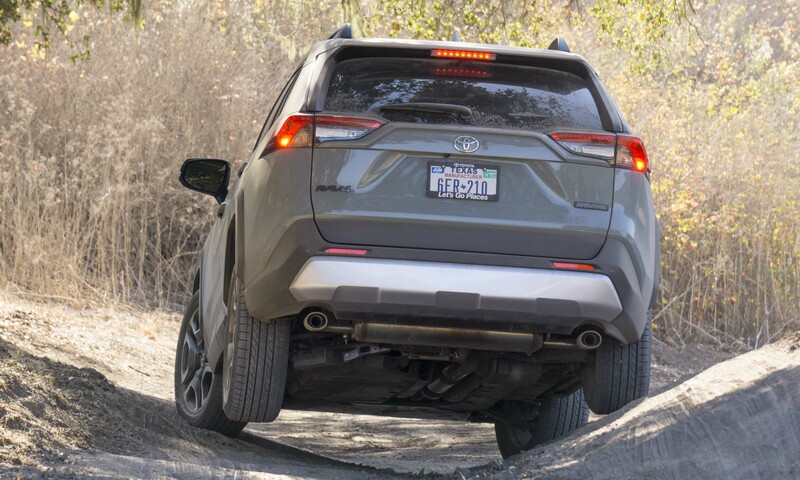 By driving the RAV4 on uneven humps we got one wheel off the ground, which showcases how torque can be directed to the wheel that has grip. 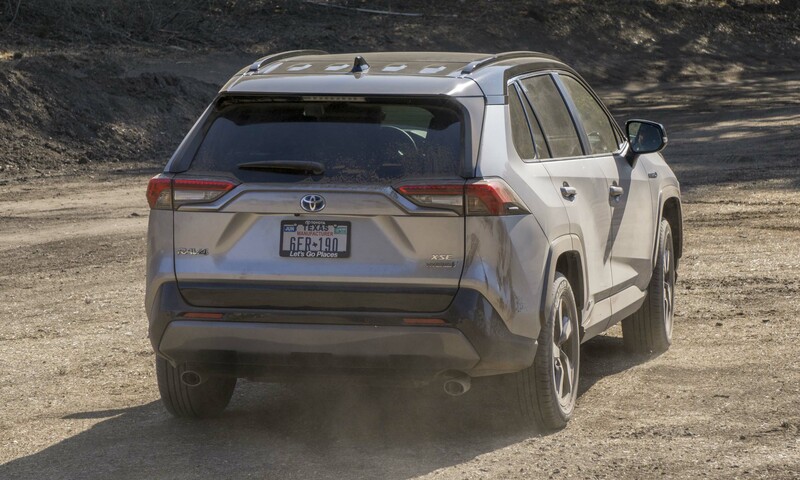 The RAV4 hybrid has a more basic all-wheel-drive system, however, it is still perfectly capable of dealing with loose and rough terrain — or snow, for that matter. 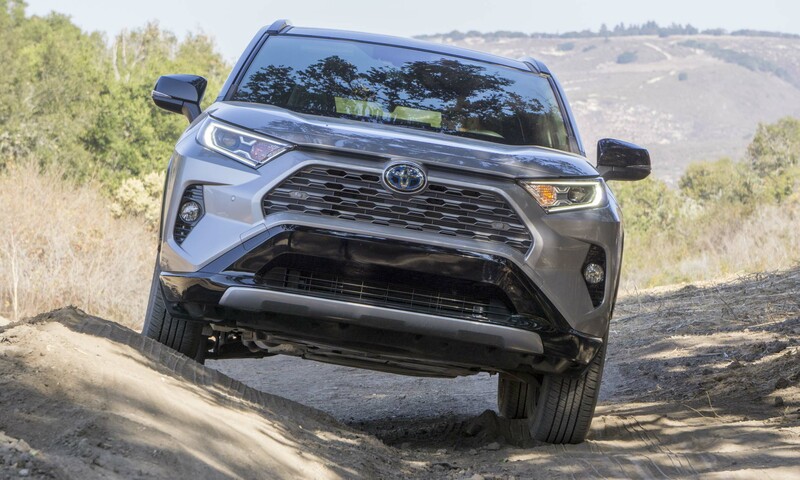 Although all versions of the RAV4 can handle rougher terrain, they are not set up for extreme off-roading like the larger 4Runner sibling. But that’s fine, since most buyers are unlikely to venture very far off the beaten path — or off pavement, for that matter. 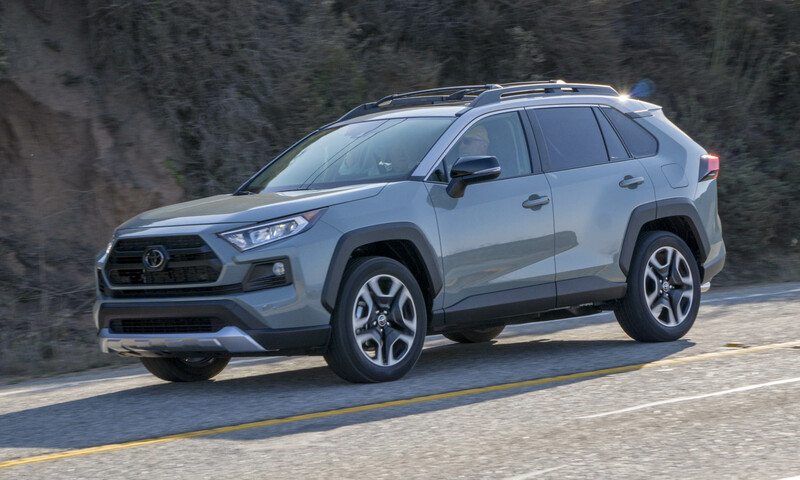 The small crossover market is one of the most contested vehicle segments in America — three of the top six models sold are small crossovers, and at the top of that group is the current RAV4. 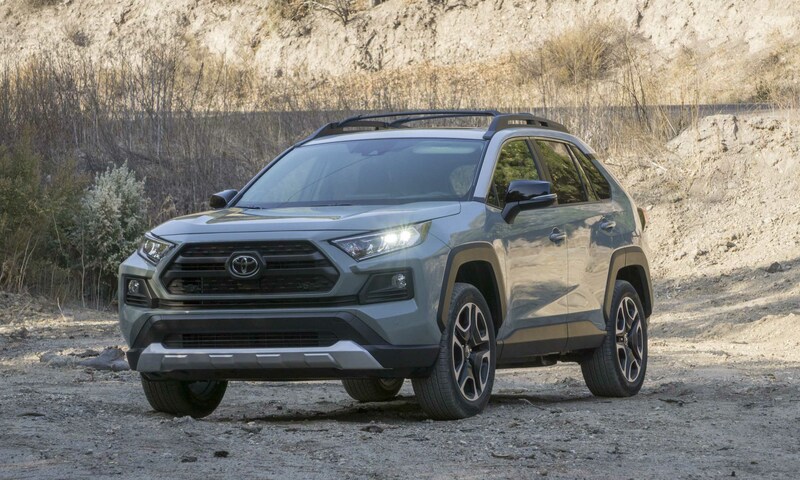 While the credo is often “don’t mess with success, Toyota has done a fine job evolving the RAV4, keeping the impressive fuel economy, a spacious and comfortable interior, good off-road capability and attractive new styling, the RAV4 will likely continue its reign as the best-selling crossover in America. With a variety of trims and powertrains to choose from, the new RAV4 will check a lot of the boxes that most new-car shoppers have on their lists. Pros: Off-road competence; fuel efficient; comfortable, stylish interior. Cons: Road noise; CVT not very engaging; no Android Auto. Bottom Line: An excellent combination of fuel efficiency and capability in a stylish new package.